I was out shopping at Kinta City last evening. I arrived pretty late as someone called up just as I was leaving the house, hence delaying me. Anyway, when I arrived, I saw that they have set up a corner with these characters from Winnie the Pooh. I have no idea why they have a corner like this. 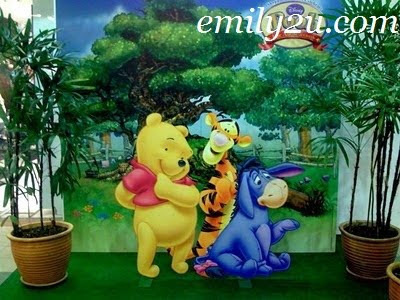 I guess it must have been set up to entice children to take pictures with these Winnie the Pooh characters, and hence, spend time at Kinta City, shopping, eating, bowling or catching a movie. In other words, SPEND MONEY THERE. It is, after all, the school holidays and this is one of the best shopping seasons for retailers. I took a few pictures of these Winnie the Pooh characters; OF them, not WITH them. I am offering one of them as a free iPhone wallpaper. If you would like a free Winnie the Pooh iPhone wallpaper, head over to my iPhone wallpaper gallery and download it. I have set it to the default iPhone size of 320 x 480 pixels. I have wanted to set up a free iPhone wallpaper gallery since late last year but I kept procrastinating. This is my first wallpaper. Hehe! Hope there will be more to come!